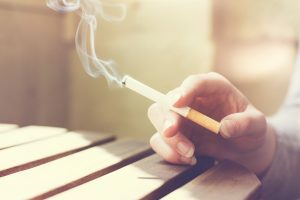 Whether a person smoked once or a hundred times, cigarette smoke odors can be pervasive in a home. If you have moved into a home that smells strongly of smoke, a simple cleaning is not likely to reduce the smells in your home. Upholstery and furniture can retain cigarette smells, just as rugs and clothing items can. If your furniture coverings are machine washable, washing them as directed is a good place to start. Most other upholstered furniture can be cleaned using a mixture of two parts water and one part vinegar. Put this mixture in a spray bottle and spritz on your fabric. The fabric should not be super-saturated – just slightly damp should be sufficient to remove smells. Removing the smells from your walls can take anywhere from a good cleaning to a complete re-painting. “Good Housekeeping” recommends you start by “washing” them with a non-abrasive, all-purpose cleaner. If this isn’t enough to remove offensive odors, a two-step process of first applying a sealant to the walls. This helps to seal in the odors and prevent them from coming from the walls again. Next, you can re-paint over the walls. While this can be time-consuming, it is the only true way to reduce cigarette smoke from the walls. Blinds retain odors from cigarette smoke. The smoke can also discolor your blinds. First clean your blinds with a solution of water and a cup of detergent that will act as a degreasing agent. While wearing cotton work gloves, dip your hand in the mixture and place the top four fingers of your hand on the top of the blinds and your thumb on the bottom. Rub your blinds side to side to clean them. After you finish this process, dip new gloves in clean water to rinse the detergent away. If this does not sufficiently remove odors from your blinds, you may need to further clean them with a rubbing alcohol solution. Mix one part rubbing alcohol with five parts water, washing with the solution in much the same way you did the detergent. You should also use a soft cloth to wipe your blinds dry after cleaning them with your gloves that had been dipped in only water. While there are some things that you can do to remove smoke smells, completely removing odors permanently usually calls for professional cleaning. This is especially true if you have carpet or area rugs that require smell removal. At Modernistic, we are the experts of professional cleaning services. Our technology can perform smoke removal from your carpets, flooring, rugs and upholstery. We also provide air duct cleaning. Your air ducts can retain residue from cigarette smoke. Mildew, mold, animal dander, dust, and dirt are also forms of residue that professional air duct cleaning can remove. Our IIRC-certified technicians can safely and effectively clean your home to remove cigarette induced odors. Give us a call to speak to a specialist, or schedule your service online today!